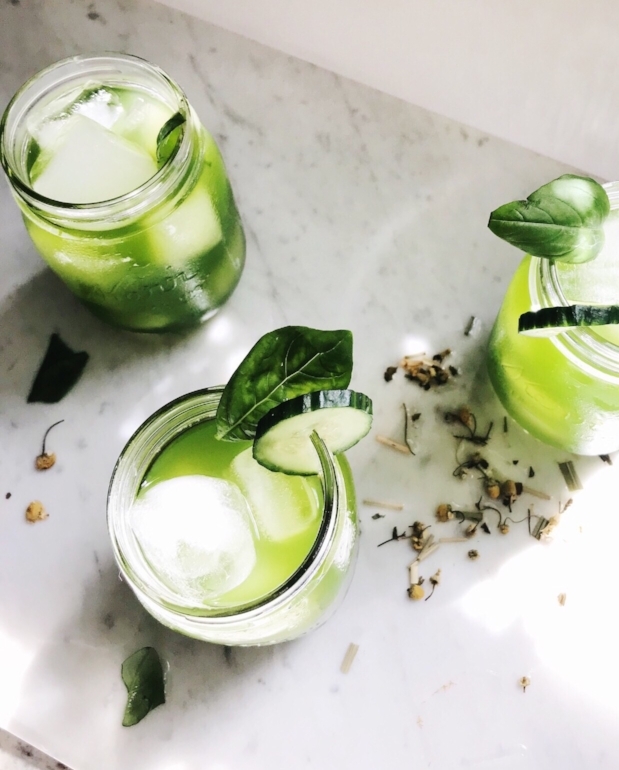 Cucumber Karma Agua Fresca | Big Heart Tea Co.
Why is it that the most bodacious, face-meltingly amazing drinks are often found far away from home? What is up with that? This Agua Fresca recipe is a perfect example of next-level summer drink perfection, Big Heart style. Inspired by the beach-meets-jungle dreamscape of Tulum, versions of this bright and verdant juice of cucumber, lime, + chia seeds can seemingly be found at every turn (and in fact, all throughout Mexico.) For our version, we added some freshly brewed Karma Chamomileon iced tea, giving the drink a refreshingly minty, lightly herbal lift with just a touch of sweetness. Yeah. We know. Where has this been all our lives? Heat 3 cups of water to 185 and steep Karma Chamomileon for 2 minutes. Set aside to cool. As tea is cooling, combine chopped cucumber, sugar, and remaining 3 cups of water in a blender. Squeeze in the juice from the lime and blend well until smooth. Now, strain the mixture through a fine mesh strainer, cloth coffee sock, or cheesecloth. Make sure to squeeze or press as much juice from the pulp as you can (this part can take a few minutes, so be patient!) When you've gotten all the juice out, discard the pulp. Add the brewed Karma Chamomileon and stir well. Bam! You've got a cooling, tea-boosted Agua Fresca, baby. Just pour over ice and serve! We love to stir in some chia seeds at the end for some fun texture, but you can skip this if you don't dig it. You can also add a little sprig of fresh mint or basil to garnish, if you're feeling fancy.